My information about Finnish American rag rug weaving comes primarily from Yvonne R. Lockwood's book (Finnish American Rag Rugs: Art, Tradition and Ethnic Continuity), supplemented by a few online sources and the memory and story fragments from my mom's video interviews and my grandma's memoir. I wish that I could have watched my grandma or my mom weaving on the Farm loom, or at least talked to them about the process. A process in which rugs are woven on a two or four harness loom using old clothes or used fabric. Used clothing or old fabric is cut into strips, joined together into one long strip (the weft), and wrapped around a shuttle. The shuttle is then pulled or thrown through an opening in the fabric that has been threaded vertically (the warp) on the loom. This opening (the shed) is created by pushing down on one of two foot pedals (treadles). 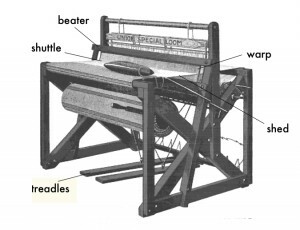 When throwing the shuttle through from right to left, the right treadle is pushed. When throwing left to right, the left treadle is pushed. 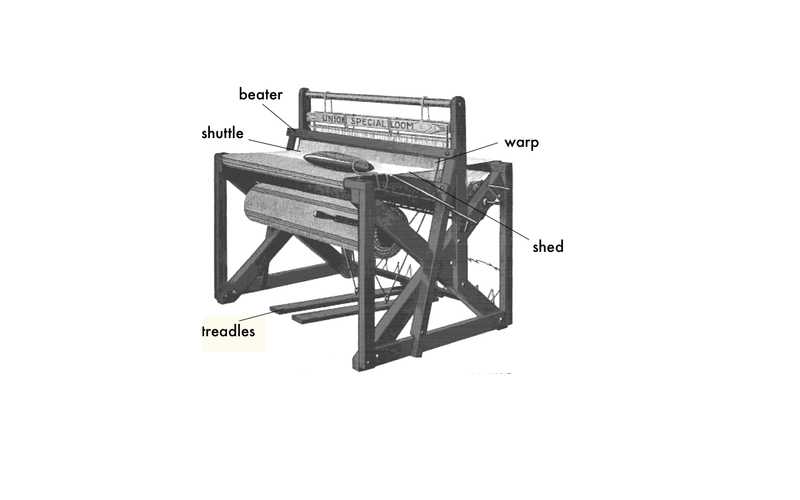 Once the shuttle is through, the weaver switches pedals and pulls the overhead bar (the beater) towards them (once or twice or more) to tighten the weave. The bar is released. As it returns to its place, it makes a loud banging noise. The process is done repeatedly, throwing the shuttle through the shed on the opposite side each time until the rug is the desired size. Many different rags can be woven on the same warp. What type of rug is produced? Traditional Finnish rag rugs were often useful, beautiful and strong. 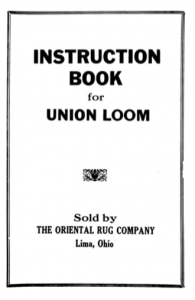 As Lockwood describes in Finnish American Rag Rugs, rag rugs were utilitarian, functioning not as decorative wall hangings but as everyday floor coverings that were placed on thresholds or in living rooms, kitchens, bedrooms, by the hearth, or on stairs to protect or warm the floors of the house. But, these rugs were more than utilitarian. Many were beautiful too. Finnish American weavers paid careful attention to the design, experimenting with patterns and colors. And these rugs were strong. Depending on their technique (how forceful and frequent they banged the beater, how visible the warp was), weavers could produce rugs that lasted for years, even decades. *note: original source for loom image above.